If you are into betting or Esports betting in general, Unibet could prove to be the best choice for you. Esports betting at Unibet will provide you with everything you need for your Esports bets. You are probably wondering what does Unibet offers? Let’s start with some basics. This Esports bookmaker was established in 1997, and we can freely say that this is one of the oldest bookmakers on the market. Unibet is a part of Kindred group, and at the moment, it is one of the most popular Esports bookmakers in that group. Esports betting at Unibet is licensed by UK Gambling Commission. Furthermore, Unibet has been awarded a lot of awards over the last couple of years. For instance, they were the best Sports Betting Operator in 2016. Alongside that, Unibet has also been awarded the Sportsbook Operator of the Year in 2014 and 2015. 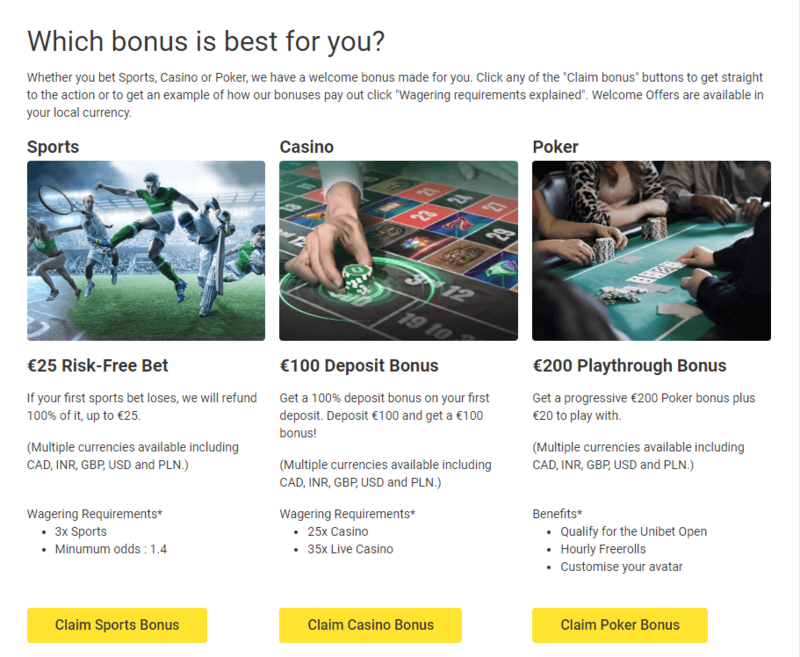 There are a lot of bonuses provided by Unibet. First of all, Esports betting at Unibet comes with a $25 Risk-Free bet. Sadly, this bookmaker does not provide you with any deposit bonuses, but this is a subject to a change in the near future. When it comes to Esports bets and titles provided by Unibet, you will definitely have your hands full. Esports betting at Unibet provides you with the best and most popular Esports titles out there. Call of Duty, CS:GO, Dota 2, Hearthstone, League of Legends, Overwatch, and StarCraft 2 are all provided by Unibet. There are also three a lot of choices for your Esports bets. For instance, you can choose between pre-match selection, outright betting and of course live betting. At the moment CSGO betting is very popular on Unibet, followed by betting on LoL and Dota 2 Esports. If you ever run into a problem, Unibet has you covered. There are three different ways of reaching out to Unibet’s support staff. Live chat is available 24/7, 7 days a week, You can also send them your query on the mail that will be provided down below. Lastly, phone number has been put in place and just like e-mail, it will be discussed down below. From what we were able to find out, CSGO betting is definitely most popular on Unibet. However, Esports betting, in general, is really popular with this bookmaker and I am sure that everyone will find what they are looking for on Unibet. Esports betting at Unibet comes with a lot of perks. Even though this is nothing new or revolutionary, there are all sorts of Esports bets provided by Unibet. To start off with pre-match betting. If you are not a complete stranger to betting, you probably know what this means. For instance, you want to place a bet on the upcoming CSGO event. You are provided with the pre-match odds for the matches in that event, as simple as that. However, this is not everything related to pre-match betting. Unibet has also provided their bettors with a lot of special bets tied to certain matches. For instance, you can bet on a team to win the first pistol round, who will get the first blood, round handicap, map handicap and plenty more. Secondly, live betting is essential for every Esports betting bookmaker out there. 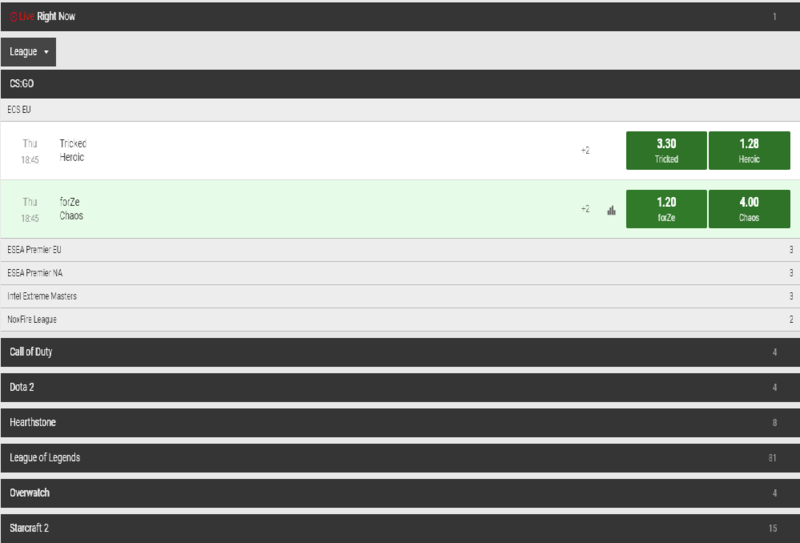 Esports betting at Unibet is also equipped with live betting. This bookmaker is also providing you with a lot of special bets for live betting, and when it comes to this section, they are unique. From my personal experience, I have never seen any other bookmaker offer so many special bets on Esports live betting. Last but not least, outright betting is an essential part of every Esports bookmaker. This betting method became popular not so long ago, but it seems like Esports bettors are really enjoying it. Even though Unibet does not offer a lot in this department, they got basics covered. You will easily be able to find CS:GO, LoL, and Dota 2 outright tournament winner odds, and that is basically it. Alongside a wide range of Esports betting options, you will also enjoy solid odds if you decide to sign up for an account with Unibet. Even though they are not offering the highest odds on the market, they are definitely among the best Esports bookmakers out there. Esports betting at Unibet comes with a couple of bonuses tied to betting odds. These are called odds enhancers, and from time to time, you will be rewarded with those. As mentioned above, Unibet is not offering the highest odds on the market, but they are surely making it competitive. By saying that, I assure you that they are definitely not offering the lowest odds out there, and bookmakers like these are the ones that are forcing others to increase their odds. Esports betting at Unibet comes with only one weakness, that being a welcome bonus. Sadly, they are only offering one welcome bonus, and it is nowhere near their competition. At the moment, you are awarded up to $25 Risk-Free bet. This is basically a 100% match which can also be translated as a deposit bonus. There are a couple of catches with this bonus. Firstly, this welcome bonus is only available for betting on Sports, which includes Esports as well. Furthermore, you will have to wager this bet only once while the minimum odds will have to be at least 1.40. There are a lot of payment methods provided by Unibet, so you will have no troubles making your first deposit. Furthermore, all of these methods are really popular, and you will definitely have an easy time depositing on Unibet. Every deposit is processed throughout a secure server, so you can rest assured that your personal and banking information is secured properly. 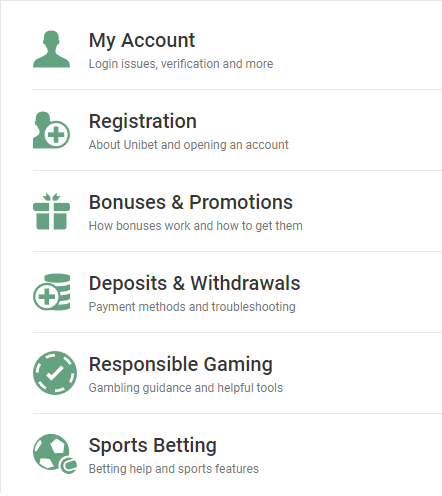 As mentioned above, there are a lot of different methods provided by Unibet such as VISA, Maestro, MasterCard, PayPal, Paysafecard, Skrill, Bank Wire and plenty more. In order to function and provide fast and reliable help, Unibet has hired a group of professionals to take care of their entire support system. At the moment, there are three different ways of reaching out to their support with your queries. The main one definitely being live chat. From what we were able to find out, staff was very professional and polite. They answered all of our queries in no time, and the best part of it was that there was barely any queue time! This support method is available 24/7, 7 days a week.